CRB3010 Carpet Shark™ 10" Counter Rotating Brush - Mytee Products, Inc.
Agitation. Encapsulation. Tile & Grout Cleaning. The Carpet Shark™ does it all. 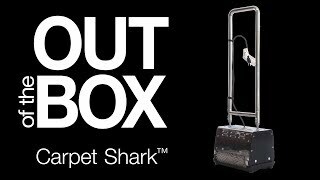 Powered by two belt-driven motors, the Carpet Shark™ operates on carpet quietly and smoothly as it lifts up dirt and other particles or agitates encapsulation chemical. Dual belt-driven motors – quieter operation and easy repairs. Easy, foot activated power switch. Collapsible handle – shorten for cleaning stairs. (With handle at full height) 9" x 11.75" x 39.75"